The London Critics’ Circle Film Awards on Sunday shared the plaudits among several films including “Boyhood”, which won three prizes, and “Under the Skin”, which won two. Richard Linklater was on hand to accept the awards for best film and best director for “Boyhood” (Universal) while Patricia Arquette (below) sent recorded thanks for her win as best supporting actress. Jonathan Glazer was there to pick up the award for best British film for “Under the Skin” (StudioCanal) starring Scarlett Johansson (pictured below) along with composer Mica Levi who beat a mix of cinematographers, production designers and costume designers to win the Circle’s annual technical achievement award. A slimmed down Timothy Spall was on hand to accept his award as best British actor of the year for “Mr. Turner” (eOne); Michael Keaton sent an amusing video in response to his win as best actor for “Birdman” (20th Century Fox) as did Rosamund Pike, who won as best British actress for “Gone Girl” (Fox) and “What We Did on our Holiday” (Lionsgate). Julianne Moore was named best actress for “Still Alice” (Curzon Artificial Eye) while J.K. Simmons won as best supporting actor for “Whiplash” (Sony). Wes Anderson sent a video to accept the screenwriter of the year award for “The Grand Budapest Hotel” (Fox) while Alex Lawther was on hand for his prize as young British performer of the year for “The Imitation Game” (StudioCanal). Other awards went to “Leviathan” (Curzon) as foreign-language film of the year; “Citizenfour” (Curzon) as best documentary with Oscar-nominated producers Mathilde Bonnefoy and Dirk Wilutzky there to accept, and Yann Demange as the breakthrough British filmmaker for “’71”. 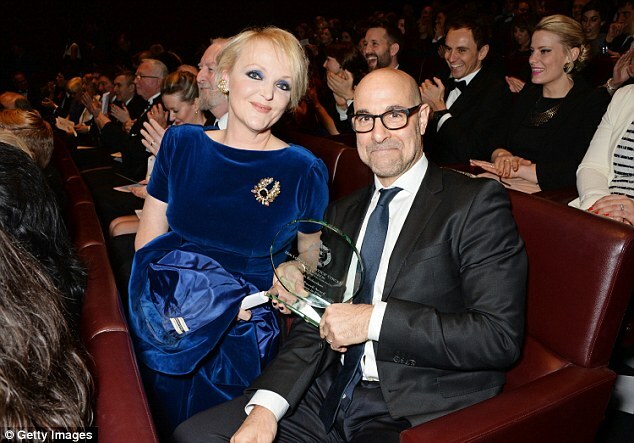 Highlight of the night was Stanley Tucci’s presentation of the Dylys Powell Award for Excellence in Film to actress Miranda Richardson. The relaxed evening continued in the May Fair Hotel bar and many of the big names stuck around to chat with critics and guests. I’d sat next to Miranda Richardson and Stanley Tucci during the ceremony and they clearly had a good time, speaking to those around them and chuckling through each other’s remarks. In the bar afterwards, when my guest, Notting Hill neighbour Karen Turner, a BBC production manager, told Tucci, who also lives nearby, that she’d seen him in our local Waitrose, he urged her to say hello next time. This entry was posted in Film, News and tagged 'Boyhood', 'Under the Skin', Jonathan Glazer, London Critics' Circle Film Awards, May Fair Hotel, Michael Keaton, Miranda Richardson, Richard Linklater, Stanley Tucci, Timothy Spall. Bookmark the permalink.